Examples of Style of the Older Halakah. Strictly speaking, the verification of the traditionally received Halakah by identifying its sources in the Bible and by interpreting these Scriptural passages as proofs of its authenticity. The term is applied also to the derivation of new halakot and legal enactments from the Bible, either by means of a correct interpretation of the obvious meaning of the Scriptural words themselves or bythe application of certain hermeneutic rules (see Talmud). The phrase "Midrash Halakah" was first employed by Nachman Krochmal (in his "Moreh Nebuke ha-Zeman," p. 163), the Talmudic expression being "Midrash Torah" = "investigation of the Torah" (Ḳid. 49b). Since all halakic interpretations were regarded as corresponding to the real meaning of the Scriptural texts concerned in each case, it was held that a correct elucidation of the Torah carried with it the proof of the Halakah and the reason for its existence. In the Midrash Halakah three divisions may be distinguished: (1) the midrash of the older Halakah, that is, the midrash of the Soferim and the Tannaim of the first two generations; (2) the midrash of the younger Halakah, or the midrash of the Tannaim of the three following generations; (3) the midrash of several younger tannaim and of a large number of amoraim who did not interpret a Biblical passage as an actual proof of the Halakah, but merely as a suggestion or a support for it ("zeker le-dabar"; "asmakta"). 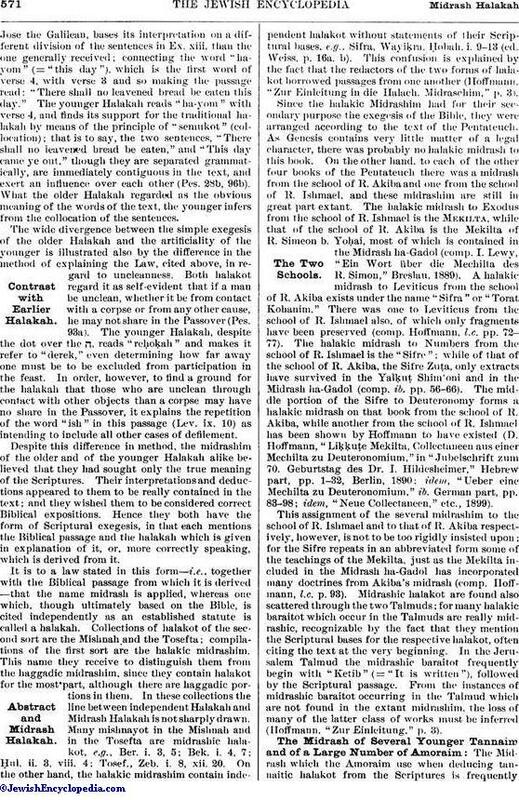 The Midrash of the Older Halakah: Examples of Style of the Older Halakah. The early Halakah sought only to define the compass and scope of individual laws, asking under what circumstances of practical life a given rule was to be applied and what would be its consequences. The earlier Midrash, therefore, aims at an exact definition of the laws contained in the Scriptures by an accurate interpretation of the text and a correct determination of the meaning of the various words. The form of exegesis adopted is frequently one of simple lexicography, and is remarkably brief. A few examples will serve to illustrate the style of the older Midrash Halakah. It translates the word "ra'ah" (Ex. xxi. 8) "displease" (Mek., Mishpaṭim, 3 [ed. Weiss, p. 85a]), which is contrary to the interpretation of R. Eliezer (Ḳid. 19b). From the expression "be-miksat" (Ex. xii. 4), which, according to it, can mean only "number," the older Halakah deduces the rule that when killing the Passover lamb the slaughterer must be aware of the number of persons who are about to partake of it (Mek., Bo, 3 [ed. Weiss, p. 5a]). Similarly the prohibition against eating the Passover lamb uncooked is derived from the word "na" (Ex. xii. 9), which, it is declared, can signify only "raw" (Mek., Bo, 6 [ed. Weiss, p. 8b]). The statement that the determination of the calendar of feasts depends wholly on the decision of the nasi and his council is derived from Lev. xxiii. 37, the defectively written "otam" (them) being read as "attem" (ye) and the interpretation, "which ye shall proclaim," being regarded as conforming to the original meaning of the phrase (R. H. 25a). 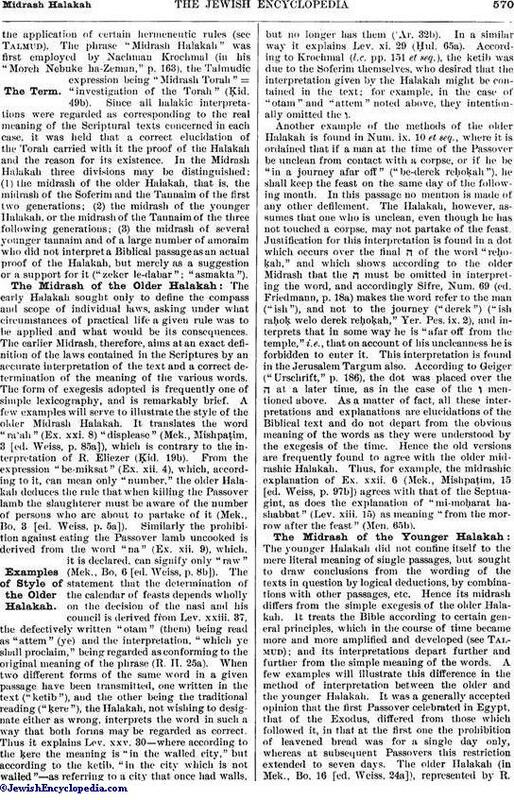 When two different forms of the same word in a given passage have been transmitted, one written in the text ("ketib"), and the other being the traditional reading ("ḳere"), the Halakah, not wishing to designate either as wrong, interprets the word in such a way that both forms may be regarded as correct. Thus it explains Lev. xxv. 30—where according to the ḳere the meaning is "in the walled city," but according to the ketib, "in the city which is not walled"—as referring to a city that once had walls, but no longer has them ('Ar. 32b). In a similar way it explains Lev. xi. 29 (Ḥul. 65a). According to Krochmal (l.c. pp. 151 et seq. ), the ketib was due to the Soferim themselves, who desired that the interpretation given by the Halakah might be contained in the text; for example, in the case of "otam" and "attem" noted above, they intentionally omitted the ו. Another example of the methods of the older Halakah is found in Num. ix. 10 et seq., where it is ordained that if a man at the time of the Passover be unclean from contact with a corpse, or if he be "in a journey afar off" ("be-derek reḥoḳah"), he shall keep the feast on the same day of the following month. In this passage no mention is made of any other defilement. The Halakah, however, assumes that one who is unclean, even though he has not touched a corpse, may not partake of the feast. Justification for this interpretation is found in a dot which occurs over the final ה of the word "reḥoḳah," and which shows according to the older Midrash that the ה must be omitted in interpreting the word, and accordingly Sifre, Num. 69 (ed. Friedmann, p. 18a) makes the word refer to the man ("ish"), and not to the journey ("derek") ("ish raḥoḳ welo derek reḥoḳah," Yer. Pes. ix. 2), and interprets that in some way he is "afar off from the temple," i.e., that on account of his uncleanness he is forbidden to enter it. This interpretation is found in the Jerusalem Targum also. According to Geiger ("Urschrift," p. 186), the dot was placed over the ה at a later time, as in the case of the ו mentioned above. As a matter of fact, all these interpretations and explanations are elucidations of the Biblical text and do not depart from the obvious meaning of the words as they were understood by the exegesis of the time. Hence the old versions are frequently found to agree with the older midrashic Halakah. Thus, for example, the midrashic explanation of Ex. xxii. 6 (Mek., Mishpaṭim, 15 [ed. Weiss, p. 97b]) agrees with that of the Septuagint, as does the explanation of "mi-moḥarat hashabbat" (Lev. xiii. 15) as meaning "from the morrow after the feast" (Men. 65b). The younger Halakah did not confine itself to the mere literal meaning of single passages, but sought to draw conclusions from the wording of the texts in question by logical deductions, by combinations with other passages, etc. Hence its midrash differs from the simple exegesis of the older Halakah. It treats the Bible according to certain general principles, which in the course of time became more and more amplified and developed (see Talmud); and its interpretations depart further and further from the simple meaning of the words. A few examples will illustrate this difference in the method of interpretation between the older and the younger Halakah. It was a generally accepted opinion that the first Passover celebrated in Egypt, that of the Exodus, differed from those which followed it, in that at the first one the prohibition of leavened bread was for a single day only, whereas at subsequent Passovers this restriction extended to seven days. The older Halakah (in Mek., Bo, 16 [ed. Weiss, 24a]), represented by R.Jose the Galilean, bases its interpretation on a different division of the sentences in Ex. xiii. than the one generally received; connecting the word "ha-yom" (= "this day"), which is the first word of verse 4, with verse 3 and so making the passage read: "There shall no leavened bread be eaten this day." The younger Halakah reads "ha-yom" with verse 4, and finds its support for the traditional halakah by means of the principle of "semukot" (collocation); that is to say, the two sentences, "There shall no leavened bread be eaten," and "This day came ye out," though they are separated grammatically, are immediately contiguous in the text, and exert an influence over each other (Pes. 28b, 96b). What the older Halakah regarded as the obvious meaning of the words of the text, the younger infers from the collocation of the sentences. The wide divergence between the simple exegesis of the older Halakah and the artificiality of the younger is illustrated also by the difference in the method of explaining the Law, cited above, in regard to uncleanness. Both halakot regard it as self-evident that if a man be unclean, whether it be from contact with a corpse or from any other cause, he may not share in the Passover (Pes. 93a). The younger Halakah, despite the dot over the ה, reads "reḥoḳah" and makes it refer to "derek," even determining how far away one must be to be excluded from participation in the feast. In order, however, to find a ground for the halakah that those who are unclean through contact with other objects than a corpse may have no share in the Passover, it explains the repetition of the word "ish" in this passage (Lev. ix. 10) as intending to include all other cases of defilement. Despite this difference in method, the midrashim of the older and of the younger Halakah alike believed that they had sought only the true meaning of the Scriptures. Their interpretations and deductions appeared to them to be really contained in the text; and they wished them to be considered correct Biblical expositions. Hence they both have the form of Scriptural exegesis, in that each mentions the Biblical passage and the halakah which is given in explanation of it, or, more correctly speaking, which is derived from it. It is to a law stated in this form—i.e., together with the Biblical passage from which it is derived—that the name midrash is applied, whereas one which, though ultimately based on the Bible, is cited independently as an established statute is called a halakah. Collections of halakot of the second sort are the Mishnah and the Tosefta; compilations of the first sort are the halakic midrashim. This name they receive to distinguish them from the haggadic midrashim, since they contain halakot for the most part, although there are haggadic portions in them. In these collections the line between independent Halakah and Midrash Halakah is not sharply drawn. Many mishnayot in the Mishnah and in the Tosefta are midrashic halakot, e.g., Ber. i. 3, 5; Bek. i. 4, 7; Ḥul. ii. 3, viii. 4; Tosef., Zeb. i. 8, xii. 20. On the other hand, the halakic midrashim contain independent halakot without statements of their Scriptural bases, e.g., Sifra, Wayiḳra, Ḥobah, i. 9-13 (ed. Weiss, p. 16a, b). This confusion is explained by the fact that the redactors of the two forms of halakot borrowed passages from one another (Hoffmann, "Zur Einleitung in die Halach. Midraschim," p. 3). Since the halakic Midrashim had for their secondary purpose the exegesis of the Bible, they were arranged according to the text of the Pentateuch. As Genesis contains very little matter of a legal character, there was probably no halakic midrash to this book. On the other hand, to each of the other four books of the Pentateuch there was a midrash from the school of R. Akiba and one from the school of R. Ishmael, and these midrashim are still in great part extant. 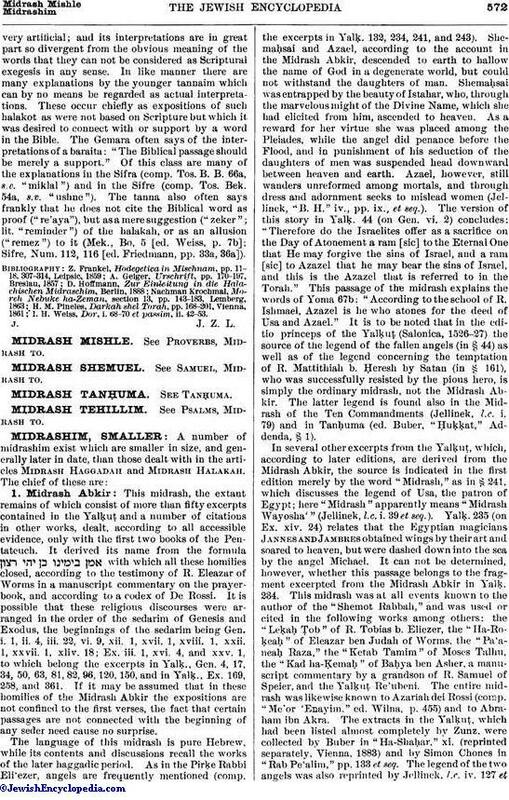 The halakic midrash to Exodus from the school of R. Ishmael is the Mekilta, while that of the school of R. Akiba is the Mekilta of R. Simeon b. Yoḥai, most of which is contained in the Midrash ha-Gadol (comp. I. Lewy, "Ein Wort über die Mechilta des R. Simon," Breslau, 1889). A halakic midrash to Leviticus from the school of R. Akiba exists under the name "Sifra" or "Torat Kohanim." There was one to Leviticus from the school of R. Ishmael also, of which only fragments have been preserved (comp. Hoffmann, l.c. pp. 72-77). The halakic midrash to Numbers from the school of R. Ishmael is the "Sifre"; while of that of the school of R. Akiba, the Sifre Zuṭa, only extracts have survived in the Yalḳuṭ Shim'oni and in the Midrash ha-Gadol (comp. ib. pp. 56-66). The middle portion of the Sifre to Deuteronomy forms a halakic midrash on that book from the school of R. Akiba, while another from the school of R. Ishmael has been shown by Hoffmann to have existed (D. Hoffmann, "Liḳḳuṭe Mekilta, Collectaneen aus einer Mechilta zu Deuteronomium," in "Jubelschrift zum 70. Geburtstag des Dr. I. Hildesheimer," Hebrew part, pp. 1-32, Berlin, 1890; idem, "Ueber eine Mechilta zu Deuteronomium," ib. German part, pp. 83-98; idem, "Neue Collectaneen," etc., 1899). This assignment of the several midrashim to the school of R. Ishmael and to that of R. Akiba respectively, however, is not to be too rigidly insisted upon; for the Sifre repeats in an abbreviated form some of the teachings of the Mekilta, just as the Mekilta included in the Midrash ha-Gadol has incorporated many doctrines from Akiba's midrash (comp. Hoffmann, l.c. p. 93). 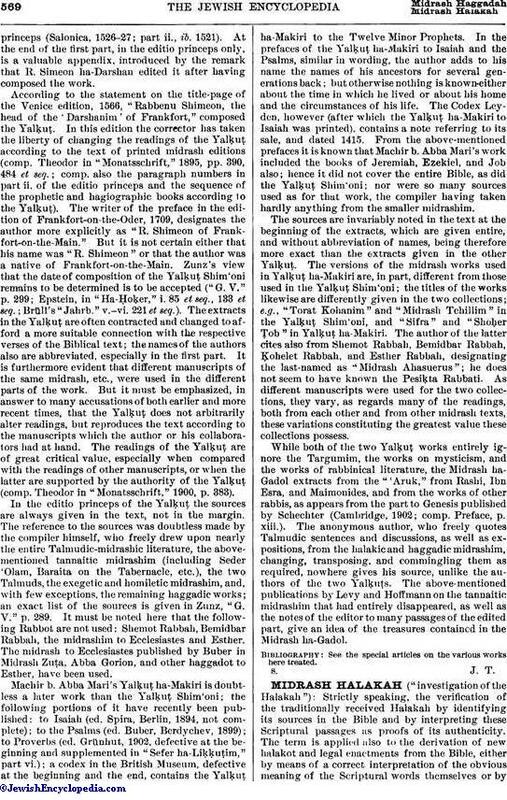 Midrashic halakot are found also scattered through the two Talmuds; for many halakic baraitot which occur in the Talmuds are really midrashic, recognizable by the fact that they mention the Scriptural bases for the respective halakot, often citing the text at the very beginning. In the Jerusalem Talmud the midrashic baraitot frequently begin with "Ketib" (= "It is written"), followed by the Scriptural passage. From the instances of midrashic baraitot occurring in the Talmud which are not found in the extant midrashim, the loss of many of the latter class of works must be inferred (Hoffmann, "Zur Einleitung," p. 3). The Midrash which the Amoraim use when deducing tannaitic halakot from the Scriptures is frequentlyvery artificial; and its interpretations are in great part so divergent from the obvious meaning of the words that they can not be considered as Scriptural exegesis in any sense. In like manner there are many explanations by the younger tannaim which can by no means be regarded as actual interpretations. These occur chiefly as expositions of such halakot as were not based on Scripture but which it was desired to connect with or support by a word in the Bible. The Gemara often says of the interpretations of a baraita: "The Biblical passage should be merely a support." Of this class are many of the explanations in the Sifra (comp. Tos. B. B. 66a, s.v. "miklal") and in the Sifre (comp. Tos. Bek. 54a, s.v. "ushne"). The tanna also often says frankly that he does not cite the Biblical word as proof ("re'aya"), but as a mere suggestion ("zeker"; lit. "reminder") of the halakah, or as an allusion ("remez") to it (Mek., Bo, 5 [ed. Weiss, p. 7b]; Sifre, Num. 112, 116 [ed. Friedmann, pp. 33a, 36a]). I. H. Weiss, Dor, i. 68-70 et passim, ii. 42-53.